In Anne Boleyn: A King’s Obsession, author Alison Weir takes well-known figures from history and offers their story in a fictional presentation. Anne Boleyn is the second in her series of the six wives of Henry VIII, and Weir gives us Anne’s story from her point of view. Presented in four parts, Weir takes us through Anne’s life from her roles as lady-in-waiting at various courts, to her ascent to the throne of England, to her horrific death. We meet Anne as a young woman from a well-to-do family. Her relationship with her sister Mary is testy; with her brother George is close. Competition between Mary and Anne is strong and often unkind. Jealousy prevails as they grow up, and when Anne is sent to the court of Regent Margaret of Burgundy before her older sister, the envy grows. It is at this point, early in the book, that Weir reveals her extensive knowledge of English history during this period. She easily weaves factual history into her fictional story, which adds to the enjoyment of reading. Weir’s character development is based on notes, letters, poems, and official documents from the time and she places her own take on these people from that data. As Anne progresses through her experiences at several courts, she eventually ends up as a lady-in-waiting for Queen Katherine of Aragon— wife of King Henry VIII. Also in attendance is Anne’s sister, Mary, who is raped by the king, and becomes pregnant with his child. Mary is banished, but not before Anne is noticed by the king, and the pursuit begins. In the reader’s eyes Anne grows from a young woman with little direction into an ambitious woman who will let little stand in the way of her own goals. There are times when Anne, as the protagonist, is not someone to cheer for, but when one considers the era and the role of women, it’s also hard to deny her her ambitions. Weir’s characterization of King Henry VIII on the other hand is a little less believable. He allows himself to be manipulated by those around him, including, and often primarily, Anne, and he is not a strong character in Weir’s development, although that may have been her goal. The dialogue Weir has created between Henry and Anne, often feels stilted; he frequently refers to her as “darling” and “sweetheart” in a whiny way that just does not sit right with history’s depiction of King Henry. Henry is often portrayed as a womanizer, which by all accounts he was. His desire for Anne grows exponentially as she continues to deny him access to her bed until they can be married, and this further drives his search for reasons to annul his marriage to Queen Katherine. In the story, as Anne finally agrees to sleep with Henry, she later finds herself pregnant, and the king finds it imperative to move forward with the annulment and then the marriage. As this relationship progresses, the annulment process hovers in the background of the story, sharing with the reader the impact on the nation and the world of the triangle created by Henry, as Katherine refuses to give him his freedom, and Anne pursues him with vigor. Weir’s handling of Anne’s relationships with those around her is well done. The destruction of her relationship with her sister Mary is deep, even as Mary’s life disintegrates. Anne’s interactions with the king’s first daughter, Mary, go beyond bad-tempered as Mary sees Anne as an interloper and the direct reason for the collapse of the marriage between Henry and Katherine. On the other side, Anne’s close connection with her brother George endures through the entire story. Weir’s characterization of George runs the gamut from bad husband to womanizer to homosexual to murderer. And yet Anne forgives him his failings and gives him the benefit of the doubt. Weir weaves the men in Anne’s life throughout the story based primarily on the factual information available to her and she does this well. This includes the power she holds over high officials as well as the power some men hold over her. When Anne gives birth to Elizabeth, the stage is set for disaster. Although Weir portrays Henry as adoring the child, Anne on the other hand is not a hands-on mother. She recognizes the importance of securing a marriage-bond for the child, but she further realizes that without producing a son, her own position is in jeopardy. Three subsequent stillborn male babies do not bode well for her, and it is not long before the king’s eyes begin to wander. Anne watches as Henry pursues one of her ladies-in-waiting, Jane Seymour, and it is not long before Anne’s enemies revel in the fact that she is now susceptible to being dispatched and a new queen put in her place. The final part of the book is gripping, as it deals with the charges against Anne, her trial, and her death. 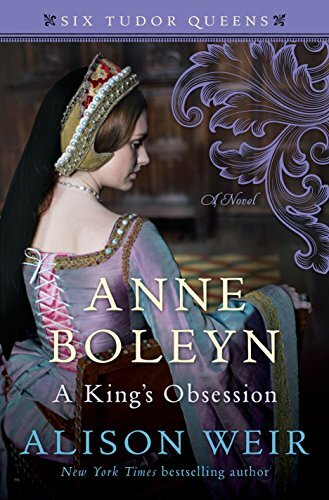 Anyone who is familiar with Anne Boleyn’s story, even just in a vague way, knows the outcome, so the ending is not a surprise, but Weir’s handling of it from Anne’s point of view is the best, and yet the hardest part of the book to read. Weir’s writing style is mostly authorial, that is, telling in nature. But the facts behind the fiction lend themselves to an absorbing novel. If this were not based in fact, it might have been a little slower read, but the way in which Weir grabs the facts of Anne’s life and lays them before the reader as fact becomes fiction makes the list of books for the library shelf.